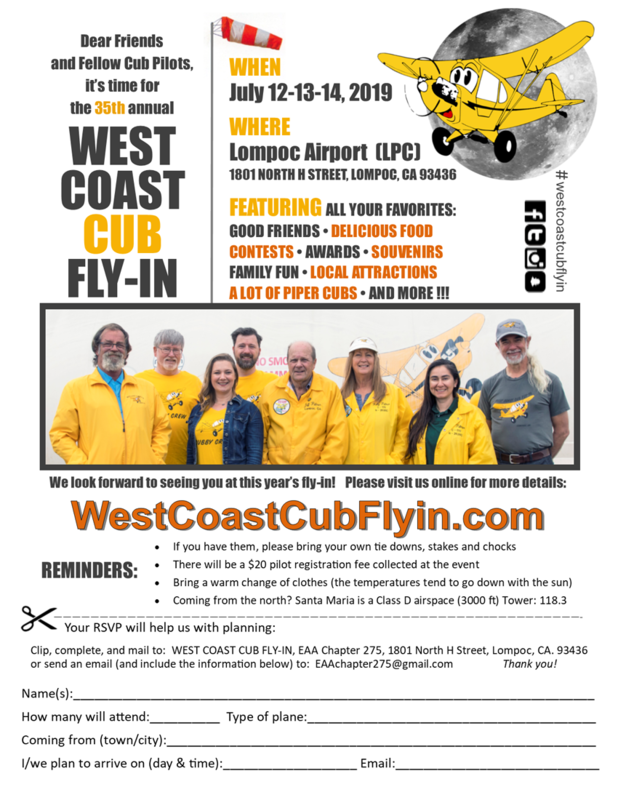 Are you ready for the 35th Annual WEST COAST CUB FLY-IN?! The event takes place on July 12th, 13th and 14th, 2019 (Friday, Saturday and Sunday). Most arrivals are typically on Thursday, and on into Friday morning, and departures are usually early on Sunday morning. And of course you’re invited! Registration is Friday and Saturday between 10am and 5pm. If you’re planning to have your plane judged and to participate in the Fly-in events, you will need to be registered by 1pm on Saturday. The registration fee is $20 which helps cover the cost of ribbons, award plaques, and door prizes. Included in the registration packet will be a Certificate of Attendance for your tax exemption filing. The Pilot’s Safety Briefing starts at 1:00pm on Saturday. To take part in the Pilot Proficiency Contests, we ask for a donation of $5 from each participant. Contests will be open to all Cubs, and will be limited to 50 planes due to the time it takes to complete the contest. Time and weather permitting, after the events we will try for the Point Conception Light House Tour. What else do we have planned?! On Friday we serve up a great Spaghetti feed, followed by dessert. Dinner starts at 6:00pm. Hamburgers, hot dogs, and soft drinks will be available during the day on Friday and Saturday. On Saturday and Sunday a super breakfast of pancakes, sausage and strawberries will be served between 7am and 10am. Then, on Saturday between 5pm and 7pm we will be serving our famous and outstanding Tri Tip BBQ with all the fixin’s! After Saturday’s dinner we will present the awards and draw for door prizes. Awards will be presented for the First to Arrive (and stay for the event), the Farthest Distance flown from home base, the Best Cub, the Oldest Cub, and the Oldest and Youngest Cub Pilot. These awards are given to the registered pilots of E & J Series Cubs and Super Cubs. We also have a Best Other Than a Cub and Pilot’s Choice awards. and let us know that you plan to attend the West Coast Cub Fly-in. Remember that the temperature goes down with the sun, so please bring a warm change of clothing. If you have them, please bring your own tie downs, stakes and chocks as the overflow and late comers will most likely be parked on the grass or dirt. Several hangars have been built where we used to park the larger and non-Cub types, so most of the non-Cub types will now be parked on the south side of the airport, next to the hotel. We don’t have much in the way of camping facilities… some folks sleep under their planes. If you choose to forego the “tarmac camping” experience, there are several hotels nearby. A few hotels are within an easy walking distance from the airport, however if you need a rental car there’s Enterprise Rent-A-Car at 1137 North H Street, Ste S, Lompoc (805) 735-4147, or Hertz Rent-a-Car at 415 W Central Ave, Lompoc (805) 736-4206. At the end of the event we would be happy to provide you with a ride back to your hotel – just ask at the T-shirt booth!